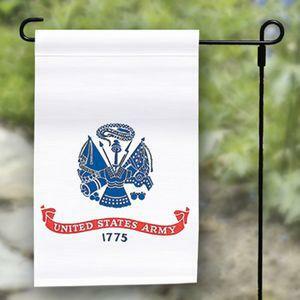 Army Garden Flag - Nylon - 12x18"
High quality outdoor nylon Army garden flag. The Army Garden Flag has a sleeved top that will slide on the popular garden style flagpoles. This Army yard flag is fully dyed for great outdoor performance. All our Army yard flags are proudly made in the USA. --- With a white background and a blue rendering of the official seal of the US Army, this military flag is classic and recognizable. The seal on the US Army flag goes back to the American Revolution, when it was used to authenticate documents from what was then called the War Office. It bears the year of the Army's establishment in 1775 and a rattlesnake (hearkening back to the "Don�t Tread on Me" rattlesnake) holding a scroll with the words "This We�ll Defend" in its mouth. Also included in the seal are a Revolutionary War American Flag, a Roman cuirass, a musket, a cannon, a snare drum, mortar and two bomb shells. The US Army flag is to be displayed first of the American Services Flags in honor of its precedence in creation (it was the first service branch created by the United States Government).